Along with being eGo 510 threaded, which allows you to use it with any eGo battery, it can be disassembled. This let you not only clean your Vase but also give you the opportunity to replace the wicks when the heads burn out instead of having to replace the entire clearomizer. 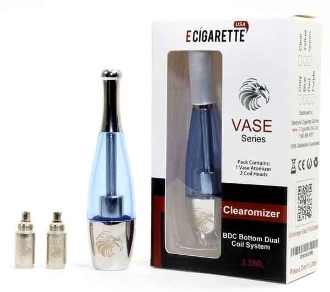 This Combo comes with 1 vase clearomizer and 2 extra dual coil wicks to get you started, and we recommend picking up several more to ensure that you always have a replacement.